Anonymous at the Economist (because everyone at the Economist is anonymous) has weighed into the debate between Ezra and me with an important question, and an incomplete answer. They [allow me this grammatical mistake so I don’t have to say “he or she”] rightly read me to argue that there may be a link between gerrymandered districts, polarization and fundraising. this logically has nothing to do with money. If we left the definition of congressional districts to an algorithm expressly designed to minimise the “safeness” of seats, the fund-raising advantages of “extreme” positioning would decline, elections would produce more moderate representatives, and partisan polarisation would decline, regardless of the campaign-finance scheme. That suggests “the current system for funding campaigns” isn’t the crucial variable. If the need to raise many small donations nevertheless continued to “exacerbate polarization” by exerting pressure to raise funds through relatively purist partisan rhetoric, couldn’t we lift that pressure by raising the cap on donations? It is true that if my hypothesis is right, ending gerrymandering would increase the cost of polarizing fundraising. That’s not enough to say it would end it. It just would not be as easy. But the last sentence quoted above is why I am insistent that the problem with Congress is not just (and not first) the problem of polarization. Because while one might well “lift the pressure” to “raise funds through relatively purist partisan rhetoric” by “raising the cap on donations,” one wouldn’t address the more fundamental problem with the current system: That the tiniest slice of the 1% is funding the elections. Two bits of recent data make this point quite clearly, and more dramatically, than I did in my book. The second is some data calculated by a fellow at the EJ Safra Center, Paul Jorgensen. 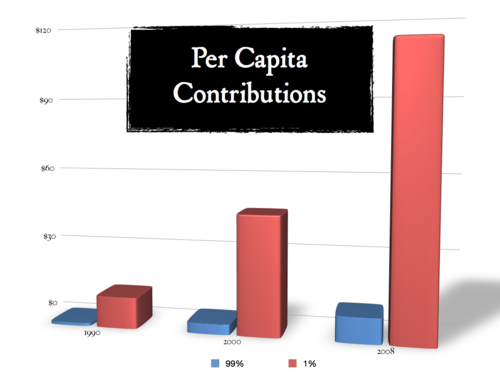 Using zipcode maps and a much cleaner dataset of contributors, Paul is able to calculate the per capita contribution of the top 1% versus the per capita contribution of the 99%. Here’s what it looks like for 1990, 2000, and 2008. If the Economist got its way, problem (2) would only be worse: the funders would be even less “the People.” And I remain convinced that one of the reasons we can’t get to Ezra’s solution to the polarization mess is problem (1): Congress is dependent upon its funders. Is there any useful precedent for a “No lobbying pledge”? There are a number of people who have been fishing around for the most effective way to do this, and some candidates for Congress who have begun to articulate the idea (e.g., Bill Shein running in the 1st District of MA), but have others before done this or tried to do this or tried to do it in an enforceable way? Rick Hasen responded to my response to his question. I return the favor here. Once again, and nicely summarized by him, I don’t like the non-transparency of AE. I have criticized it and I agree it should be criticized. But my point is about the kind of harm we should expect the non-transparency to produce. Or not produce, as I believe. Rick has usefully identified some harms that I didn’t describe. I’ll discuss those below, but none strike me as fatal. He has also identified harms that I don’t believe are harms. But to see why, we have to be clear about what we’re describing here. AE is a platform. It will give one candidate a chance to get on 50 ballots, and challenge the Democratic and Republican nominee. What will that candidate owe AE? Gratitude, no doubt. But is there anything in that gratitude that should lead anyone to worry that the candidate will bend one way or the other because of these secret funders? How could it? If the candidates don’t even know who the funders are (and I can attest with certainty that Roemer (who also is critical of the nontransparency) doesn’t), how is the position of the funder supposed to affect the candidate and his or her positions? Well, Rick suggests, maybe its through the selection mechanism. Maybe they’ll rig the ballot, or muck about with the votes. But that is a separate point from the question about the transparency of the funders. I completely agree that there has to be absolute confidence about the process for the AE candidate to have any credibility. If anyone could even wonder whether the ballot has been rigged (because of course, in real world elections, we never have to worry about such things), that’s a very good reason to be skeptical of whoever the candidate is. So of course, the integrity of the voting process is a critically important issue, and I remain open to being convinced that AE hasn’t done enough to earn the public’s confidence about that. But distinct from that question, I am still left wondering: how could the secret funders corrupt anything? Or more precisely, how could the secrecy of the funders corrupt anything? I reject Rick’s suggestion that this is anything like transparency in a ballot measure. Of course, knowing who funded which side of a ballot measure is a good indicator of what the ballot measure means. And I don’t doubt the big funders of AE have a desire about how their experiment will change the nature of American democracy (though I believe that is less about a particular substantive agenda and more about a frustration with these two parties). But assuming again no one can muck about with the count, what they’re funding is a platform on which Ron Paul or Ralph Nader or Buddy Roemer or Jimmy Wales all get to compete. And the question, still, in my view, not answered, is how secret donors are going to steer this wide platform of potential competitors one way or the other (again, especially if they’re secret!). Rick’s right to say that there are lots of ways the levers might be manipulated. (And he should know: He’s got a fantastic book coming out called The Voting Wars, which recounts lots of examples of levers being manipulated, though none involving AE). But, again, that could happen whether or not the funders were known. And if that does happen (or if there is not enough reason to be confident that it hasn’t happened), that’s the reason to be skeptical or critical or nonsupportive of the AE candidate. Not because of a mysterious bias that comes from people the candidate doesn’t even know. I was on @MorningJoe today with @BuddyRoemer, talking about (surprise, surprise) money in politics. Mika asked me whether I thought that in 2008, Obama was a Roemer-like reformer. Of course he was!, I said. But then I said something that — in the binary way that is politics today — was understood by many (as the twitter flame war suggests) to imply that I was just a sour-grapes Clinton supporter, still trying to prove that she would have been the better candidate. So, first: I was, from the start, an Obama-fanboy. I was in 2004 (when I wrongly predicted he’d run (for the first time) in 2012). I was in 2007 (when I was urged by friends not to alienate the Clinton campaign by coming out for someone who could not possibly win). When he did win, I was convinced that he was going to be the greatest President of our time. I believed then, and still do now, that he might be the only politician in America who could rally America to the change we need. then real change — change that will make a lasting difference in the lives of ordinary Americans — will keep getting blocked by the defenders of the status quo. But could Obama reclaim this cause now? Of course he could, and of course he should, but he needs to confront the issue directly and honestly and with the humility that a once-disappointed-public will demand. He must ask America (again) to help him take on a system that will always and systematically block reform, whether from the Right or the Left. He must show America how just about every issue they care about is tied to this corruption. E.g. : Our economy is choking not because Keynesianism is wrong. It is choking because gamblers on Wall Street threw it over the cliff. And how could that have been allowed? Because Wall Street had purchased the right to gamble (with a government bailout guaranteed) from Democrats and Republicans alike, both eager to give Wall Street whatever it wanted in exchange for almost endless campaign contributions. E.g. : Climate Change legislation: It wasn’t just the Republicans who blocked that reform. It was Democrats, too, who recognized that they couldn’t survive the money campaign that would be waged against them by endless anti-reform money. And, finally, he must commit to clear and explicit reforms that would actually change this system. Not just the puny reform of disclosure — important, but not anything that would change anything real. Not just the end to day trading on the the floor of the House. But the fundamental reform that this system needs. So yes, Obama will fund this campaign not just with $50 contributions, but also, and increasingly, with donations in $35,000 chunks. But if he is to be a credible reformer, he must promise us that the first bill he will send to Congress on January 20, 2013 will be a reform that would replace large dollar funded elections with small dollar, citizen funded campaigns. And yes, Obama must now encourage a pro-Obama superPAC. But if he is to be a credible reformer, he must also promise us that he will get Congress to propose the Amendment that would correct the error of Citizens United, and restore to Congress the power to limit independent expenditures. Sure, many will remain skeptical. Many are committed cynics. But certainly, fewer than if he pretended the issue wasn’t even there. We all get the need for compromise. We don’t get the need to only compromise. If he did this, again and again, he might reclaim what he once held with certainty: the banner of a reformer. And he might even redefine this election to be about something more than whether Madison and Jefferson and Kennedy were right about the separation of church and state. If he spoke clearly and powerfully about the elephant in the room, he might well be able to scare that elephant. Again. And if he doesn’t, then we outsiders must do whatever we can to get him to. Including supporting openly and strongly any principled and serious candidate who would put this issue where it needs to be: At the center of this campaign, and at the core of what the next government does.